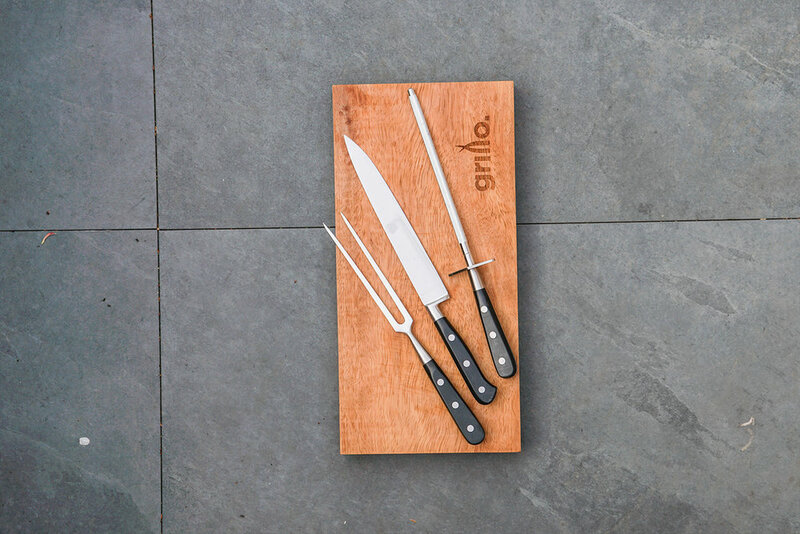 The Grillo range of products come fully equipped, ready for beautiful cooking and socialising. Everything is included as standard; from the utensils to the logs (ready-stacked), the corkscrew to the complementary salt block. Find a complete list of accessories below. The Chef's Anvil is a fantastic centrepiece for any outdoor area. 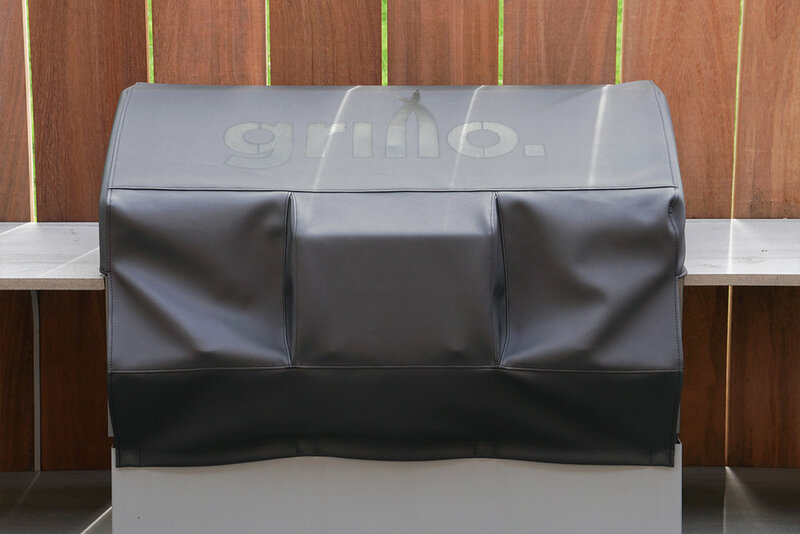 For convenience it's hard to beat an inbuilt gas grill. Other barbeques and pizza ovens are available, click here to see the range. Covers are provided for the Anvil and the Cadac grill. We recommend covering the barbeques when not in use, primarily to preserve their appearance. A sturdy material, a tight fit, drawstrings and magnets prevent the covers disappearing in the usual manner when it gets breezy. Hardwood logs are provided (and stacked) as part of the package. We've found that slower-burning hardwoods such as oak produce the best coals for cooking over. The Anvil scraper is the most effective tool for cooking food on the Anvil. Its sharp, flat blade makes it ideal for turning food, distributing hot oil, and scraping cooked-on food and excess fat into the embers. 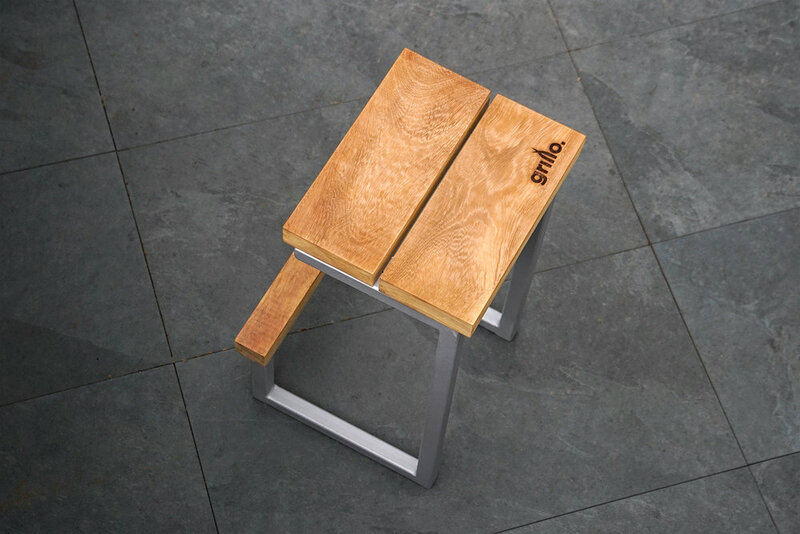 The Forge barstool is designed to blend in beautifully with the rest of the kitchen, and shares the same timber used for the solid uprights around the Grillo area. 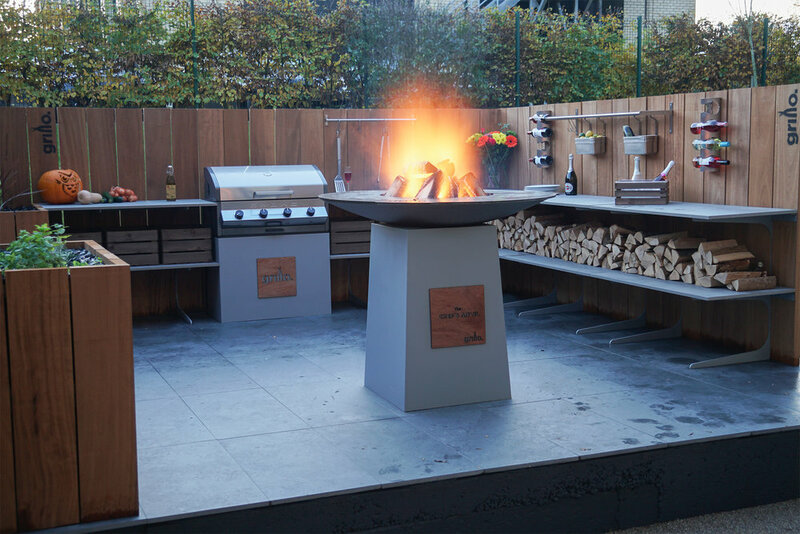 This gives a truly bespoke finishing touch to your outdoor kitchen. Barstools come as standard with any layout that includes a bar section. Critical for churrasqueiras, a long metal skewer is provided with the Anvil. Churrasco is the practice of cooking meat on a skewer over an open fire. At 80cm long, this skewer is somewhat larger than your typical kebab skewer. The solid aluminium support post (provided) sits at the edge of the inner ring of the Anvil hotplate. The Anvil comes with a separate grill plate to add to its versatility. 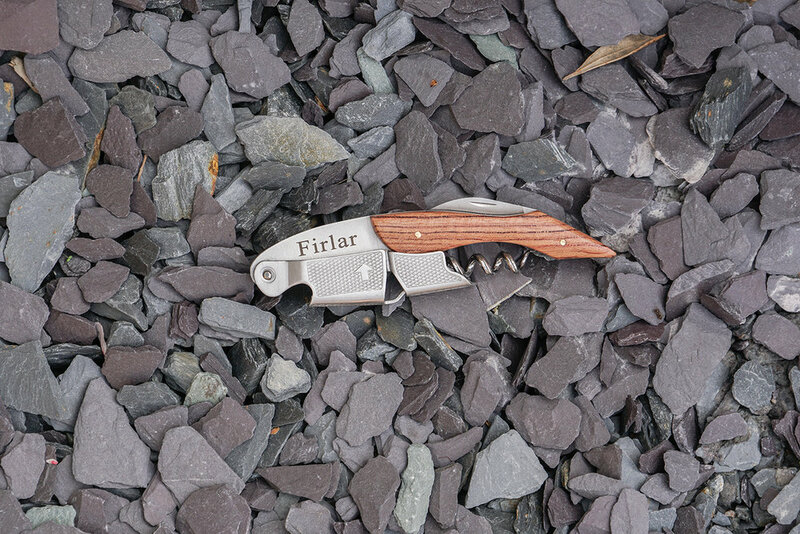 The carving knife is vital for churrasco, and is a useful tool to have on hand when barbecuing. Our carving board is crafted from durable hardwood timber. 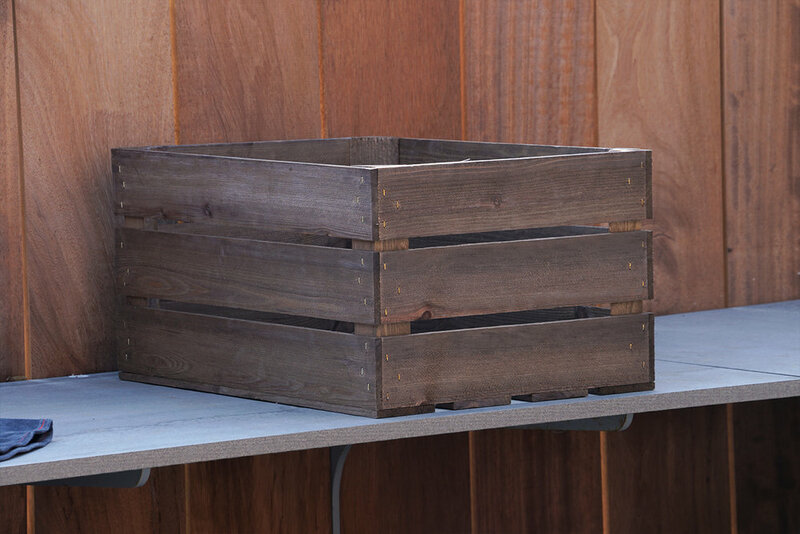 Wooden crates are provided with the Grillo Forge. They fit neatly onto the lower shelving, and are a useful way of organising your workspace and preventing clutter. One of the crates comes with an inset (but easily removable) ice box, useful for chilling your champagne. A sturdy, long-handled fire iron is used for distributing coals around the edges of the Anvil's bowl. The corkscrew is an important tool for helping with socialising. 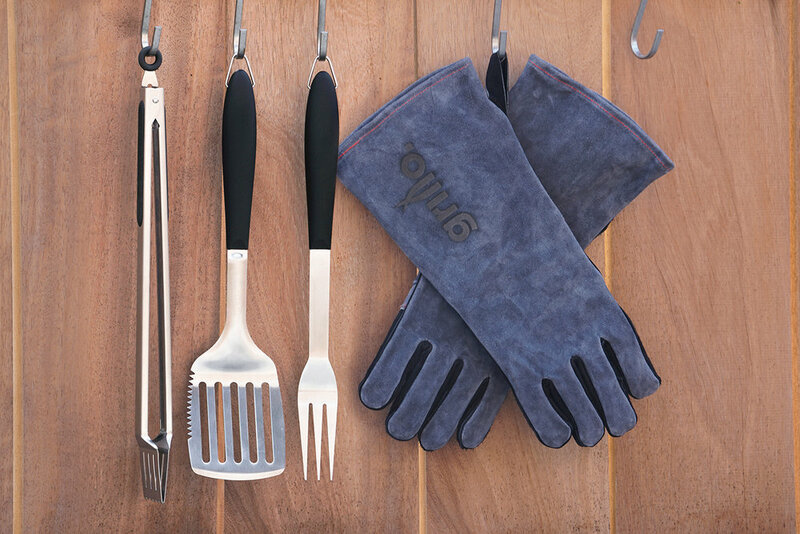 The Grillo Forge comes with integrated stainless steel shelving, wine racks, hanging basket and utensil hooks, to make you al fresco cooking as simple and beautiful as possible.